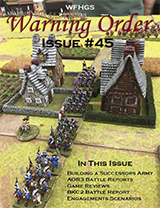 Warning Order, a free wargaming e-magazine, now has issue #45 available to download. This issue has a number of varied features that starts out with building a 28mm Successor army for Hail Caesar along with resources for the Successors period. There are also a large number of battle reports for AOR 3rd edition along with a discussion on how it plays, a F&F ACW for Corinth, a BKC2 game where the Americans finally get into the action, and a WMM game that takes place at the end of the Crusades. There is also a complete Saga scenario along with a replay of the game. Wing Leader: Victories and the U.S. Civil War from GMT Games get reviewed plus there are two new Engagements scenarios as well as the usual features in this issue.